Five months on from a devastating flood, Carmarthen saleroom Peter Francis enjoyed a day in the sunshine and some excellent results at their quarterly ‘fine’ sale on February 13. More than 600 lots totalled over £250,000. a gratifying result reflecting so much hard work both in recovering from the trauma of the flooding and putting together such a good auction – adding that – there is much to look forward to – including the return of central heating! It was on October 13 when, in the wake of Storm Callum, the River Towy entered full flood and spilled into Carmarthen. The Towyside saleroom on Old Station Road was engulfed in nearly 4ft of river water with the sale floor, some stores, offices and the reception area all impacted. Welsh primitive child’s chair made £2300. 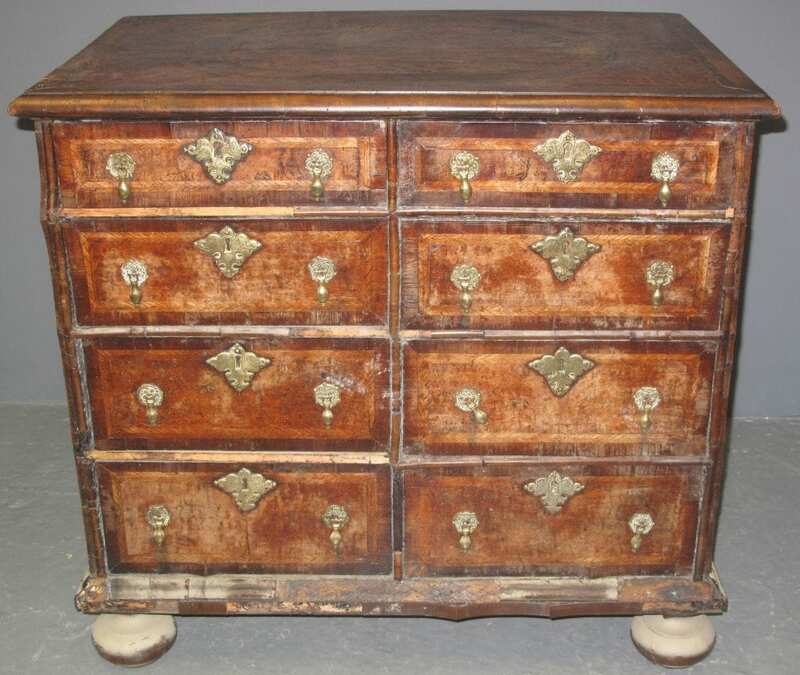 Rare William & Mary burr elm chest sold for £4000. and he was quick to pay tribute to all of those who had helped get the show back on the road in remarkably quick time. We all greatly appreciate the good wishes we have received as well as offers of help from many quarters. I must congratulate and thank all our staff, who have worked tirelessly to achieve so much in such a short space of time. Their motivation and energy seems boundless. Nothing would have happened without them. The February sale included lots consigned before the inundation, new instructions and a few pieces of furniture that were offered for sale in water damaged state. These included a rare William and Mary burr elm chest that had been compensated by the insurers at £10,000. The water had reached the top drawers and much of the herringbone and cross banded veneer was now loose and the carcass has distorted but it nonetheless sold for £4000 (plus 20% buyer’s premium). Another damp item of furniture, a spectacular French walnut and marquetry serpentine fronted display cabinet c.1875, compensated by the insurers at £12,500, managed a still impressive £3600, despite its deteriorating condition. 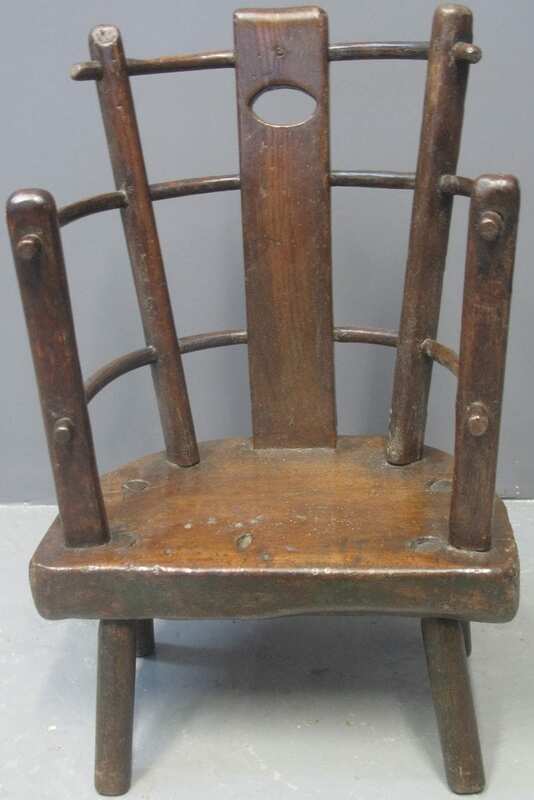 In rather better condition – though with nice colour and patination – was an unusual probably 18th century Welsh primitive child’s chair or back stool with a pierced back splat, bentwood arms and turned legs. It proved a favourite of many at £2300. 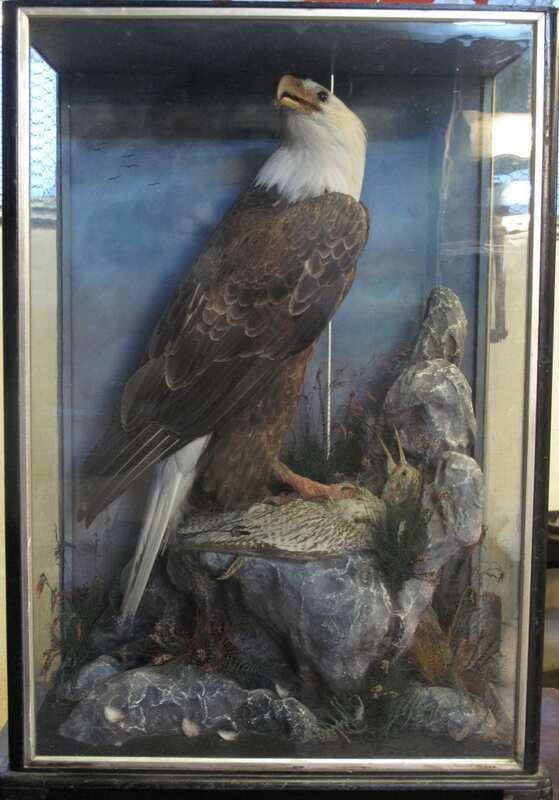 A spectacular taxidermy mount – an American bald eagle with curlew prey – was probably by James Hutchings of Aberystwyth, one of the best British regional taxidermists working from the 1860s to 1942. This 1.03m high case, mounted with rockwork with ferns and foliage, had been abandoned by the tenants of a local home and was being sold by the new occupants. In good condition, it sold to a collector in North Wales bidding on the phone at £3650. Welsh art was popular across the board. The oil on board town scene Newlyn Church by Edward Morland Lewis (1903-43) with label verso for the The London Artists Association was one of two works that came for sale from the family of the artist. It sold at £1300. Prints by Sir Kyffin Williams (Penrhyn Du, numbered 57/150 and Ceri Richards (The force that through the green fuse drives the flower, signed and dated 1965) sold at £580 and £620 respectively. The leading picture was The Deposition of Christ, or the Entombment by the Islington-born artist Elijah Albert Cox (1876-1955) sold at £1400. A rare geometric Yo-Yo vase – among the most adventurous of all Clarice Cliff Art Deco designs – smashed its estimate to realise £2300. It was the first example Nigel Hodson had seen since he sold a larger pair for almost £10,000 when working in the Midlands in his youth. A group of Royal Worcester porcelain miniatures did very well to fetch £1900. They included pieces by some of the best-known Worcester artists of the early 20th century Ernest Barker, Harry Stinton and Edward Townsend. A collection of late 19th-century Bavarian cuckoo clocks from one local elderly expert were a near sell-out. An elaborate example heavily carved and decorated with hunting trophies took £1300 while a clock with a two-train musical movement housed within a similar case carved with a leaping stag chased by a stag and two eagles was bid to £1400. A small early 20th-century Russian kovsh cup with cloisonné enamel decoration well exceeded its estimate to bring a flat £2000 while a massive solid silver table centrepiece modelled as a swan (London 1972) weighing 190oz exceeded its estimate at £3600. A record 800 bidders had registered online for the sale alongside a huge number of phone lines. 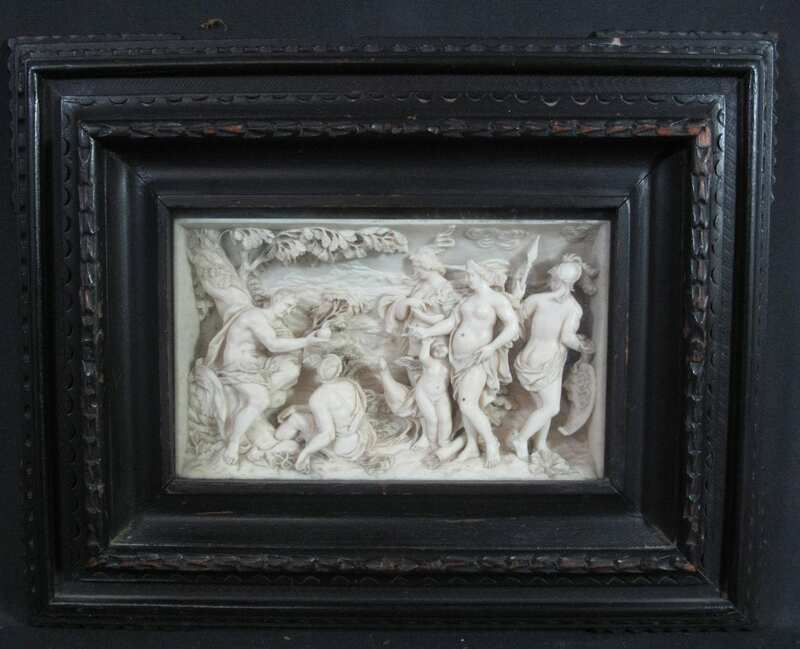 It was an online bidder who secured two 17th century style ivory panels – each deeply carved with classical subjects and hosted in ebonies frames. Very conservatively estimated due to the currently difficult nature of their medium, they realised £3600. Vehicles were led by a 1968 Mini 1000 MkII in local ownership all its life, for restoration, at £4100 and a 1988 Honda C90 Cub motorbike the property of an 84 years old Carmarthen lady who has decided its time she gave up biking. This sold on a commission bid to a collector from near Bath at £1500. A rare early 20th century wooden AA sentry-type phone box, which provided a base for patrol-men between emergency calls and provided a means for members to seek assistance, took £500. The sale closed with a good Second World War Military Cross medal group awarded to Peter Herbert Mason (1914-1995) of the Second Battalion Royal Fusiliers (City of London Regiment). Captain Mason served with the Long Range Desert Group in North Africa and with a similar reconnaissance and raiding unit in Italy. His medals, including miniatures, sold at £1300. Sales will now continue every fortnight throughout the year with additional online special sales and valuation days in-house and at various venues including Margam Park in March. The contents of a museum of domestic life is planned for a little later in the year. Note: all prices in this report do not include 20% buyer’s premium.